Our Foodies might be celebrating National Cheeseburger Day next week with this classic burger that can be ordered at the bar at Jonathan’s Ristorante in Huntington village. MMM, CHEESEBURGERS: Lovers of cheeseburgers rejoice: National Cheeseburger Day is Sept. 18. How will you be celebrating America’s favorite sandwich? Our Foodies have a few favorite burger joints around town, including the newly-opened Burgerology (308 Main St., Huntington). We also highly recommend checking out the bar burger at Jonathan’s Ristorante (15 Wall St., Huntington); it’s a classic combo of top sirloin, cheese, lettuce, tomato and onion, and of course it’s served with a side of fries. What’s your favorite burger around town? We’d love to hear about it, and see a picture of it! Send it all in to info@longislandergroup.com. In the meantime, here’s a bit of burger background to bite down on. There are many theories to the beginning of the cheeseburger dating back to the ’20s. One story suggests that Lionel Sternberger invented the cheeseburger in 1926 while working at his father’s Pasadena, California sandwich shop, The Rite Spot. During an experiment, he dropped a slice of American cheese on a sizzling hamburger. However, there’s speculation that the cheeseburger wasn’t introduced until 1928 when it appeared on the menu at Los Angeles restaurant O’Dells, which also smothered the burger with chili, all for 25 cents. The Shed is planning to open up at 54 New St. in Huntington, the former location of True North, later this month. EAT WELL. DRINK: Our Foodies have gotten word that The Shed Restaurant is gearing up to open up in a couple weeks. 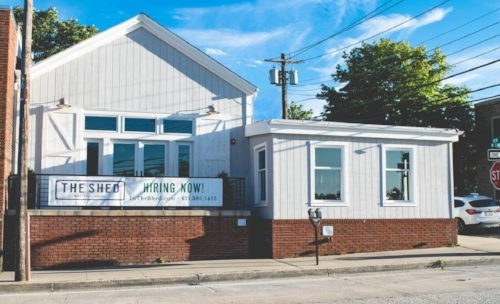 The Shed, which is moving into the former True North location at 54 New St., Huntington, is now hiring, according to its Facebook page and signage outside the soon-to-be-open restaurant. The Facebook page also promises that The Shed will serve American comfort food along with cocktails and beer. There will be an outdoor patio, bar with a deck and dining room. The Foodies will keep you posted when we learn more. But make sure to keep tabs at Facebook.com/TheShedRestaurantNY. A plate of wings from Changing Times in East Northport is the perfect dish on a football Sunday. FOOTBALL’S BACK: Do you love football? How about wings? Maybe a side of beer to go along with it? Well these bars and restaurants across town have you covered. Nag’s Head (396 New York Ave., Huntington) shows every NFL game on Sundays, and has some specials to go along with the action. Pints of Ballast Point are just $4 and the bar also offers buckets of beer. And even better than that is the free food, wings and Italian hero that are available, starting at 12 noon. Meanwhile in East Northport, Changing Times (526B Larkfield Road) offers specials on Mondays, Thursdays and Sundays. For Monday Night Football, Sam Adams pints are $5; 24 oz. stadium chuggers of either Bud Light or Coors Light are $4; Blue Moon and Blue Point pitchers are $13; and a bucket of either five Miller Lites or five Miller Genuine Drafts are $25. For Thursday Night Football, there are wing specials, along with both the Sam Adams and Bud and Coors light specials. On Sunday during the games, the 24 oz. Bud and Coors lights are still $4; Blue Moon and Blue Point pitchers are $13; and buckets of Corona or Heineken are $25. Fireball shots are also $2 during the two-minute warning commercial break in Jets/Giants games. Over at The Lark Pub & Grub (93 Larkfield Road, East Northport), along with food and drink specials, there will be weekly jersey giveaways. Pictures of the jerseys are posted to the Lark’s Facebook page on the days leading up to the Sunday games. During the games, beers, wings and pizza are $5 each. Did we miss your favorite football-related special? Let us know about it by dropping a line to info@longislandergroup.com.